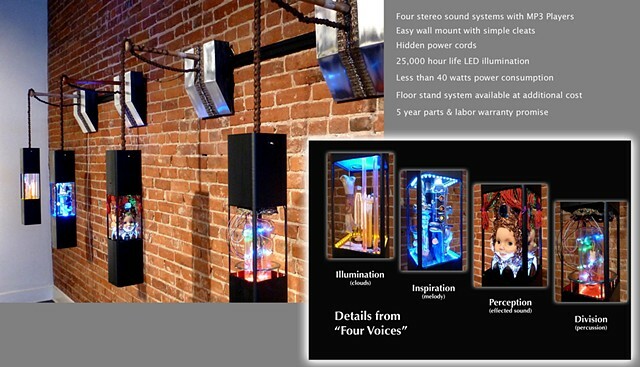 Four Voices can be viewed at Modern Theater of Spokane, 174 S Howard Street in Spokane, Washington. It is located in the upper lobby outside the main entrance to the theater auditorium. Four separate hanging lanterns each house a tableau lit by LED, cold cathode fluorescent or incandescent light. Within each piece is an MP3 player and stereo computer speakers. The left channel emits from the top and the right from below. The music was composed and produced over a one year period in 2005-06 using both physical and virtual digital synthesizers. The sound effects were gathered, edited and processed during that same time. Each piece plays its own part of a four-part performance. The players have been programmed to play the files randomly, creating a unique performance at any given moment. To give a little breathing room, all units contain 20 files of pure silence ranging from 2 to 240 seconds. These are included in the random play sequence. The tonal music is created in the B-flat pentatonic scale: B-flat, C, D, F and G. However there is one file that plays an A-natural. See if you can find it. This reduces the chaotic “arcade effect” of hearing multiple sources of varying tonal centers. Sometimes the sound is harshly avant garde and at other times it feels peaceful and meditative. When four silent tracks happen to be playing simultaneously, there is no sound at all.